Uxmal was a Mayan city of significant importance during the 10th century. The city was founded sometime around 500 by the Xiu dynasty which ruled over it for many subsequent centuries. It forged a close alliance with the Mayan city of Chichen Itza and possibly because of this alliance, became the most important city in the Puuc region in the 9th and early 10th century. However, soon after the city suffered decline and the population was significantly reduced. Extant ruins at the site of Uxmal include a large number of buildings with a unique architecture. Among them is the Magician’s pyramid, the Nunnery Quadrangle, the Governor’s Palace and the House of Doves. The city of Uxmal was founded by Hun Uitzil Chac Tutil Xiu sometime around the early 6th century. Most of the structures found in modern-day ruins of Uxmal were constructed when the city rose to prominence and influence during the late Classic and post-Classic period. Many notable buildings in Uxmal have been dated back to sometime between the 8th and 10th centuries. Although the decline of the city began in the 10th century, some structures were built even after that. It was in the 12th century that all construction came to a halt which suggests that around this time, the city was abandoned. The Pyramid of the Magician as shown is one of the most notable extant structures among Uxmal ruins. The Pyramid of the Magician is one of the most notable extant structures among Uxmal ruins. It is a stepped pyramid made in an extraordinary design. It rises to an immense height of 131 feet and comprises of five different levels, one built on top of the other. According to modern researches, it has been found that the structure was built in multiple stages over a period of 400 years. Moreover, the pyramid is not built in the rectilinear shape that was common among Mayans and rather has an elliptical shape. The construction of the pyramid is done so that it directly faces the rising sun on summer solstice. The pyramid is considered a significant part of the Mayan history because it figures prominently in Mayan folk-lore tale of the “The Dwarf of Uxmal”. The Nunnery Quadrangle is another iconic structure that is present among Uxmal ruins. The structure was originally built in the 9th century and comprises of an immense courtyard which is surrounded by rectangular buildings on all the site. The courtyard is accessed via a huge staircase that ascends to the level of the quadrangle which is raised above the surrounding landscape on a platform. 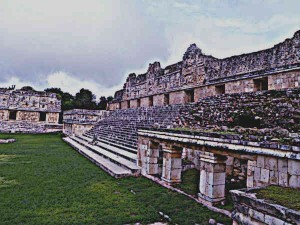 The entire quadrangle is built using the highly decorative architectural style which was prevalent in the Puuc region. All the buildings in the quadrangle also carry richly ornate exterior decorations in the form of root-combs, vaults on the walls and samples of well-carved masonry. Nunnery Quadrangle Buildings – In all, the Nunnery Quadrangle has four rectangular buildings located in four directions around the central courtyard. In all, the Nunnery Quadrangle has four rectangular buildings located in four directions around the central courtyard. The South Building has 9 doorways and is accessible through a second staircase which ascends from the courtyard. Opposite the South Building is the North Building with 13 doorways and a terrace with multiple chambers. The West Building has 7 doorways and probably represents the Mayan Middleworld. Opposite it is the East Building. All the four buildings have intricate exterior decorations depicting Mayan gods, scenes from Mayan mythology and different animals. Historians have been unable to ascertain the exact use to which the building was put when it was built. The Governor’s House is another major structure in the Uxmal ruins and is one of the most magnificent buildings at the site of the city. It was constructed during the 10th century to commemorate the ascension of the final Uxmal ruler, Lord Chahk. It is divided into three parts, all closely built and the central part being the largest portion of the structure. The three parts are connected via corbel doorways and all the external façades of the entire structure carries rich carvings in stone. One of these carvings depicts the portrait of Lord Chahk while others depict serpents, depiction of Mayan mythological scenes and several other motifs. The building was originally constructed as the royal residence and was used both as the ruler’s residence and as the administrator hub of the city. It is excellently well-preserved among extant Uxmal ruins. An interesting structure that exists in Uxmal ruins has been dubbed the House of Doves. The building has been so named because it features a large structure with small openings much like dovecots. These dovecote-like openings sit on top of an archways and rise towards the top in a pyramid-like fashion. In total, three such pyramid-like clusters of dovecots are situated at this site. Archaeologists believe that this structure dates back to the earliest days of the site of Uxmal, being one of the oldest buildings in Uxmal ruins. 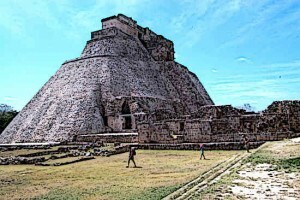 Grand Pyramid is another structure in Uxmal ruins located opposite the Pyramid of the Magician. Unlike the Pyramid of the Magician, visitors are allowed to climb to the top of the Grand Pyramid. The steps of the Grand Pyramid lead up to a temple dedicated to the Mayan god of rain and thunder, Chaac. Compared to the ruins of other Mayan cities, the ruins of Uxmal are notable because the structures of Uxmal are built in a unique Puuc style. As a result, all the structures in Uxmal are highly decorative and are meant to awe and inspire the onlooker, not just by their size but also through their highly intricate exteriors. Uxmal was one of the most notable Mayan cities in the Puuc region in the Terminal Classic and post-Classic period. The city was founded sometime around 500 A.D. and reached its peak between 850 and 950, largely thanks to its alliance with the Mayan city of Chichen Itza. Most of the structures found in the modern-day ruins of the city were constructed during this period. The decline of Uxmal began in 10th century and was cemented by the 12th century. A large number of excellently built and well-preserved structures dating back to the heyday of Uxmal can still be visited at the site of its ruins.